The TextBeam 300 (reviewed in Pro Mobile 75 - out next week!) 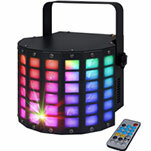 is a multicolour text laser that lets users create animations, effects and rolling, scrolling laser text, thanks to its powerful 300mW RGB laser and easy to use keyboard/remote control setup. For mobile DJs, this means being able to type messages, announcements and information which appears instantly in laser form, allowing them to produce personalised messages for their audiences and clients, whether congraulating a newly married couple or telling guests that the buffet or bar is open. These messages can be typed using the keyboard (which includes upper and lowercase text) and phrases of up to 12 characters may be displayed, while longer sentences require use of the laser's scrolling feature. Animated shapes and themed animations can also be generated, whether for classic laser shows or New Year, birthday and Halloween parties, allowing mobile DJs to match their lightshow to suit the events they work and audiences they perform for. "As a sometime DJ myself, I understand the importance of making your show stand out from everyone else," said Lamba Technical Director, Paul Bierton. "With the Kam TextBeam 300 laser, you can customise and personalise your show to create a stunning lasting impression. The ease of use and the impact you can create with this laser make it a great addition to any DJ’s armoury. The fact that you can also use it as a tunnel and beam laser is a huge bonus." Helping make these plug-and-play text and effects easy to trigger, Kam offers users three control modes: auto, sound-to-light and DMX. 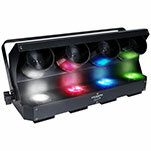 This makes the effects of the TextBeam 300 easier to incorporate into a wider lightshow, whether DJs want the laser text and shapes to move in time with music or they want to produce a customised RGB laser-text display using DMX. These effects can also be conveniently triggered and controlled using the included remote control. Robust thanks to its metal chassis, the TextBeam 300 is also lightweight (2.75kg) and compact (190 x 175 x 110mm), making it easy to store and transport as part of a mobile setup. 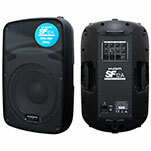 Due to this portability, mobile DJs have the option to incorporate multiple TextBeam 300s into their setup, giving them more flexibility in the displays they create. Want to know more about the Kam TextBeam 300? Don't miss the full review in Pro Mobile Issue 75 – coming soon!